This weekend's college Gameday Giveaway matchup is a battle of Texas teams: Texas at Texas Tech (tomorrow, 6:30 PM Central). To be counted, your prediction must include winner, final score, & total yards (total yards is in case of a tie). Any prediction submitted after kickoff will not be accepted. The closest prediction wins a small family package (1.5 pounds of meat & 3 pints of sides - $40 value) from Austin's very own Blue Ribbon Barbecue! You can enter your prediction via comment below this post, via email, or you can tweet it to @ManUpTexasBBQ or submit via Facebook. I'd like to know what other BBQ bumper stickers are on the road. If you see one and/or have one, send us a pic! These 5 category winners went head-to-head, to determine the overall winner. Congratulations to Lead Dog Savory (North Pole, Alaska)! I Am A Texan's "TOP 10 BARBECUE SPOTS IN TEXAS"
Saw a link last night to another Top 10 list for Texas BBQ joints. This one is courtesy of the site I Am A Texan. Without further ado, here is their list of the Top 10 BBQ joints in Texas. As always, when the Cowboys play, 2 links of sausage from Lockhart Smokehouse are up for grabs! This week's giveaway matchup is Washington at Dallas (tomorrow, 7:30 PM Central). To enter the giveaway, submit your prediction (winner, score, total yards) via blog comment, Facebook, Twitter, or email. You have until kickoff to submit your entry, so don't wait! As always, when the Texans play, a whole slab of pork ribs from Pizzitola's BBQ is up for grabs! This week's giveaway matchup is Houston at Tennessee (tomorrow, noon Central). To enter the giveaway, submit your prediction (winner, score, total yards) via blog comment, Facebook, Twitter, or email. You have until kickoff to submit your entry, so don't wait! This weekend's college Gameday Giveaway matchup is a battle of Texas teams: Texas Tech at TCU (tomorrow, 2:30 PM Central). To be counted, your prediction must include winner, final score, & total yards (total yards is in case of a tie). Any prediction submitted after kickoff will not be accepted. The closest prediction wins a gift basket (seasonings, t-shirt, kookie, etc.) 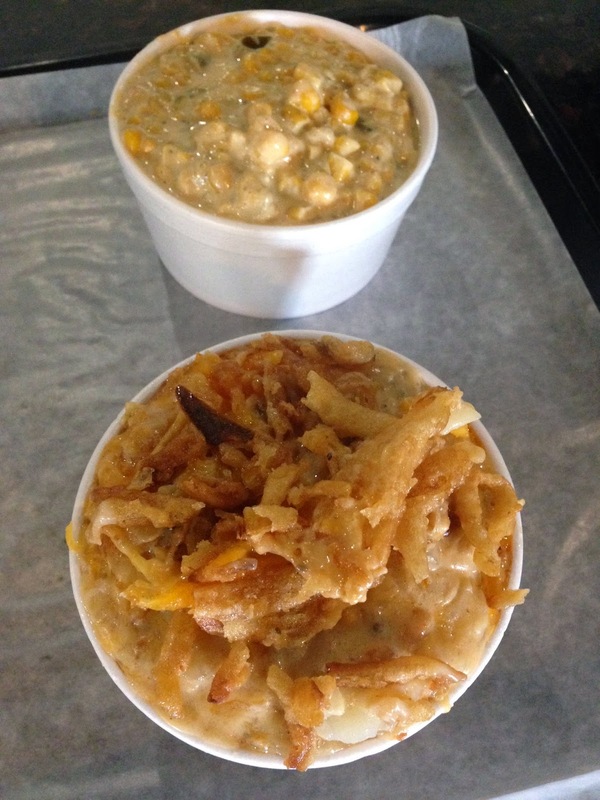 from Johnny's Steaks & Bar-Be-Que (Salado, TX)! You can enter your prediction via comment below this post, via email, or you can tweet it to @ManUpTexasBBQ or via Facebook. Last Thursday night, I picked up about 10 pounds of BBQ from Rudy's (Austin, TX) for a gathering of 20 or so. Got all 3 cuts of brisket, 2 kinds of sausage, & some smoked turkey. 5th Annual Gettin' Sauced! is in the books! Sunday was our 5th Annual Gettin' Sauced! festival. It was such a great time! The weather was beautiful, the venue was fantastic, and all of the booths were outstanding. To our sponsors: Thank you. To all of our BBQ and non-BBQ booths: Thank you. To our venue: Thank you. To our live-music acts: Thank you. To our contestants: Thank you. To all of our rock-star volunteers: Thank you. And to everyone who came out and enjoyed the BBQ, sauce, drinks, booths, & live music: Thank you. We sincerely appreciate you and thank you for spending your Sunday afternoon with us. Cheers to all of you! Tonight's dinner: Gettin' Sauced! leftovers! Yesterday, Miche Bread sent me home from our 5th Annual Gettin' Sauced! festival with a loaf of the bread they served at the festival. And Snow's BBQ sent me packed with some smoked turkey. Therefore, tonight's dinner was a smoked-turkey sandwich, courtesy of both! As always, when the Texans play, a whole slab of pork ribs from Pizzitola's BBQ is up for grabs! This week's giveaway matchup is Houston at Pittsburgh (tomorrow, 7:30 PM Central). To enter the giveaway, submit your prediction (winner, score, total yards) via blog comment, Facebook, Twitter, or email. You have until kickoff to submit your entry, so don't wait! As always, when the Cowboys play, 2 links of sausage from Lockhart Smokehouse are up for grabs! This week's giveaway matchup is New York Giants at Dallas (tomorrow, 3:25 PM Central). To enter the giveaway, submit your prediction (winner, score, total yards) via blog comment, Facebook, Twitter, or email. You have until kickoff to submit your entry, so don't wait! This weekend's college Gameday Giveaway matchup is a another battle of undefeated teams: Notre Dame at Florida State (tomorrow at 7:00 PM Central). To be counted, your prediction must include winner, final score, & total yards (total yards is in case of a tie). Any prediction submitted after kickoff will not be accepted. The closest prediction wins a $25 gift card from Austin's very own SLAB BBQ! You can enter your prediction via comment below this post, via email, or you can tweet it to @ManUpTexasBBQ or via Facebook. Gettin' Sauced! Bottled Contest tonight! Our 5th Annual Gettin' Sauced! Bottled Contest is tonight! We have sauce entries from throughout the country, from Alaska to Florida. I don't get to take part in the blind judging, but I look forward to tasting the winners from each category. Good luck to all of the entrants! In addition to BBQ, BBQ sauce, and beverages, and water, there's more at this year's 5th Annual Gettin' Sauced! festival. Live music from Fog & Bone, followed by Mayeux & Broussard. Miche Bread, our official bread sponsor, will have a booth with a selection of artisan breads for you to sample. OMG! Cheesecakery, the event's exclusive dessert vendor, will have a lineup of personal-sized cheesecakes for purchase. KIND Healthy Snacks will be on hand with, you guessed it, healthy snacks! Stop by TexasFood's booth & Texas Irons' booth. Snag Gettin' Sauced! merchandise: t-shirts, koozies, pint glasses, & screen-printed posters. If you're looking for a hotel, discounted rates are available at Radisson Hotel & Suites Austin Downtown, the official hotel of this year's Gettin' Sauced! 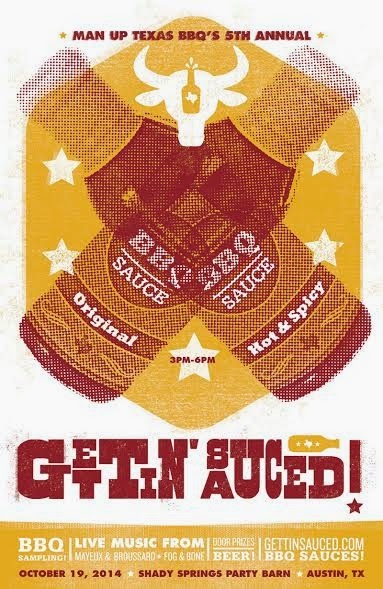 Visit the Gettin' Sauced! website for complete details. In addition to craft beer and cider, we will have complimentary non-alcoholic drinks from HonestTea & Cuvee Coffee. Finally, cold water will be for sale. Gettin' Sauced! is 1 week from today! Our 5th annual Gettin' Sauced! contest & festival, presented by TexasFood.com, is 1 week from today! Join us for TexasBBQ, cold drinks (alcoholic & non-alcoholic), artisan bread, desserts, snacks, live music, door prizes, & more! Event entry is free, though sampling the BBQ and BBQ sauce will require a BBQ wristband. General-Admission wristbands are $15 online & $20 at the gate. VIP wristbands are SOLD OUT. BUY WRISTBANDS! Whenever the Cowboys play this season, 2 links of sausage from Lockhart Smokehouse are up for grabs! This week's giveaway matchup is Dallas at Seattle (tomorrow, 3:25 PM Central). To enter the giveaway, submit your prediction (winner, score, total yards) via blog comment, Facebook, Twitter, or email. You have until kickoff to submit your entry, so don't wait! This weekend's college Gameday Giveaway matchup is a battle of undefeated Texas teams: TCU at Baylor (tomorrow at 2:30 PM Central). To be counted, your prediction must include winner, final score, & total yards (total yards is in case of a tie). Any prediction submitted after kickoff will not be accepted. The closest prediction wins an all-you-can-eat meal for 2 at Kreuz Market (Lockhart, TX)! You can enter your prediction via comment below this post, via email, or you can tweet it to @ManUpTexasBBQ or via Facebook. Hat tip to Eater Austin for reporting la Barbecue is planning to open a brick-&-mortar spot on South Congress Avenue. Location & expected opening date TBA. BBQ tourin' with some Aussies! Back in May, I had the pleasure of taking an Australian couple on a BBQ tour. They wanted to get a taste & feel for Central Texas BBQ joints, since they run a BBQ company (Smokin' Barry's) in Melbourne. 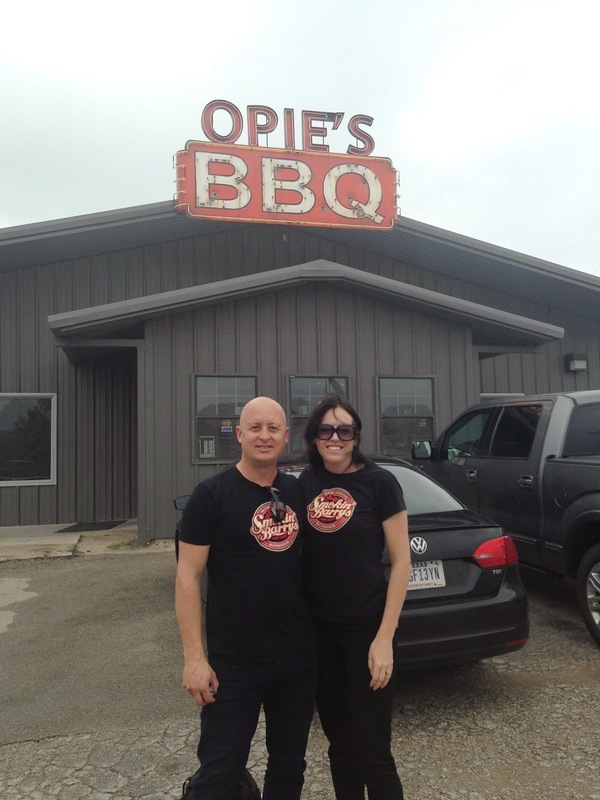 I took them to Opie's (Spicewood), Hays County (San Marcos), Black's (Lockhart), & Valentina's (Austin). They were an absolute pleasure to spend the day with. I meant to post the pictures long before now, but better late than never! First stop: Opie's. After the meal, owner Kristin Ashmore was kind enough to spend time outside by the smokers talking shop with my clients. This year's Gettin' Sauced! poster! Particularly since I have absolutely no design skills, I always enjoy seeing our Gettin' Sauced! poster. Each year, I crack up thinking, Imagine if I'd been the one to design it. Anyway, last night, I saw this year's poster for the first time. As always, posters will be available for sale at the festival and (after the event) via our website. 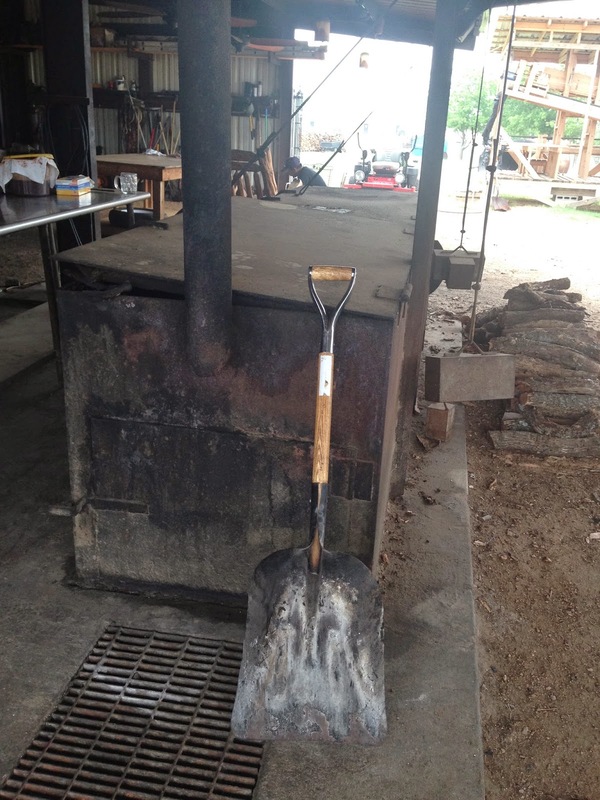 What is the best BBQ joint in Blanco County? Finishing our journey around Travis County, we arrive at our final adjacent county: Blanco County. BC is home to towns like Blanco and Johnson City. 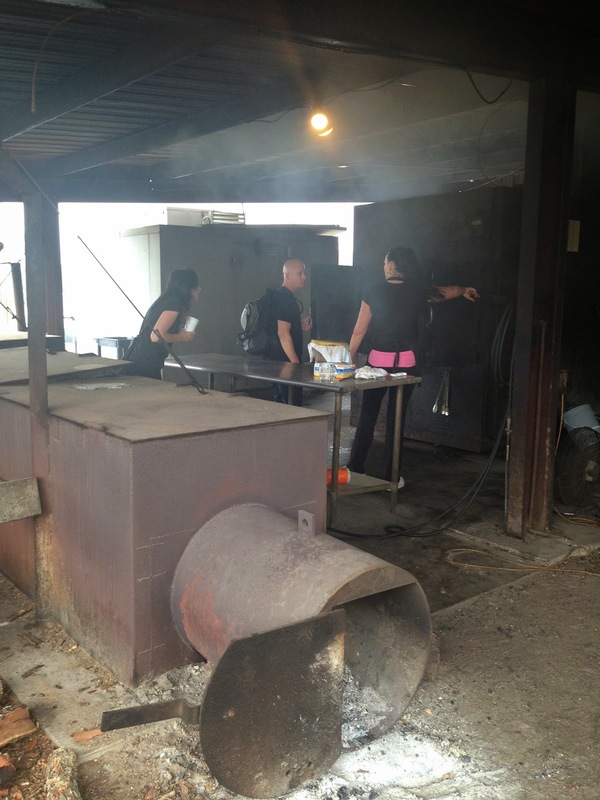 Which BBQ joint in Blanco County is the best? Gettin' Sauced! is 2 weeks from today! Our 5th annual Gettin' Sauced! 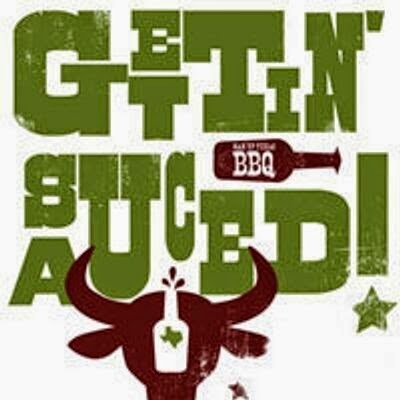 contest & festival, presented by TexasFood.com, is 2 weeks from today! Join us for TexasBBQ, cold drinks (alcoholic & non-alcoholic), artisan bread, desserts, snacks, live music, door prizes, & more! Event entry is free, though sampling the BBQ and BBQ sauce will require a BBQ wristband. General-Admission wristbands are $15 online & $20 at the gate. VIP wristbands are $35 online and at $40 the gate. VIP wristbands include entry to the event 30 minutes before general admission. BUY WRISTBANDS! We have quite the treat for you this week. Each week, we hold separate giveaways for the Cowboys game and the Texans game. Well, tomorrow at noon Central, these two teams face off with each other in Dallas, so 1 game = 2 giveaways! So, the winner gets 2 prizes: 2 links of sausage from Lockhart Smokehouse & a slab or pork ribs from Pizzitola's BBQ! To enter the contest, submit your prediction (winner, score, total yards) via blog comment, Facebook, Twitter, or email. You have until kickoff to submit your entry, so don't wait! This weekend's college Gameday Giveaway matchup is Baylor at Texas (tomorrow at 2:30 PM Central). To be counted, your prediction must include winner, final score, & total yards (total yards is in case of a tie). Any prediction submitted after kickoff will not be accepted. The closest prediction wins a $20 gift certificate to Cooper's Old Time Pit Bar-B-Que, & the winner can use the GC at any location of Cooper's! You can enter your prediction via comment below this post, via email, or you can tweet it to @ManUpTexasBBQ or via Facebook. What is the best BBQ joint in Hays County? Making our way around Travis County, just 2 counties remaining in my round of questions about the best BBQ joint in each county adjacent to Travis County. Next up: Hays County. 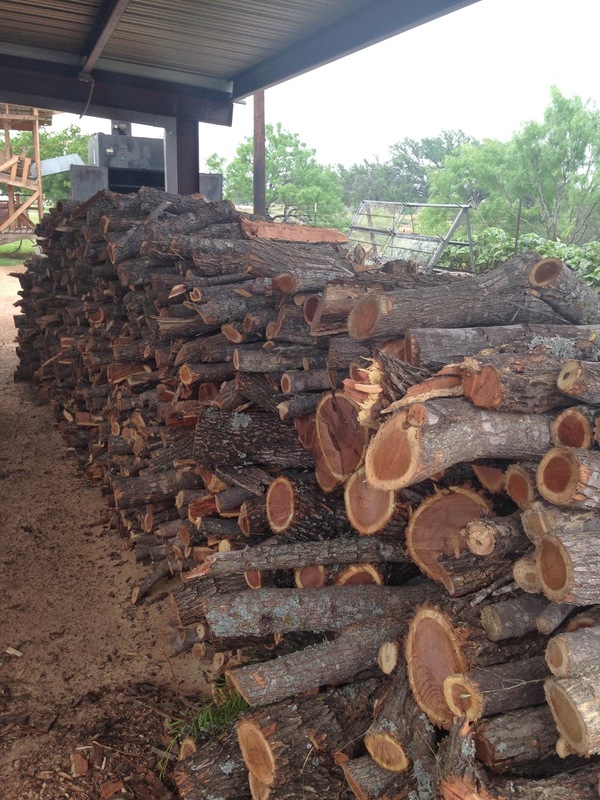 HC is home to Buda, Driftwood, Dripping Springs, Kyle, San Marcos, Wimberley, and other little towns. Of all the BBQ joints in the county, which is tops?